This car reminds us of an era when electric cars were common on our roads and the petrol car was yet to reign supreme. In the early decades of the twentieth century the Detroit Electric was the most successful of the many electric cars on the market. 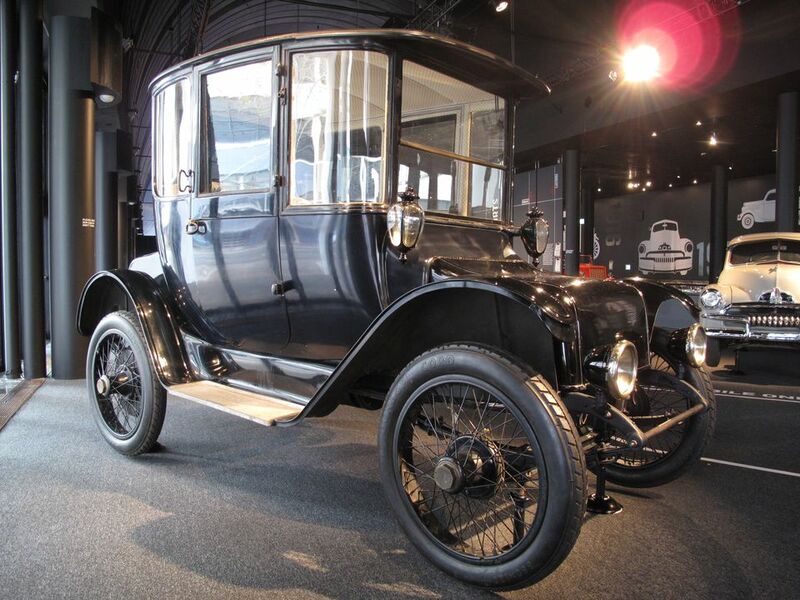 It led the field in terms of longevity, and its design, based like other early cars on a horsedrawn carriage, stayed constant long after it became unfashionable. Full size motor car with an 80 volt 10 hp motor mounted into the centre of the body. The object is finished in black enamel paint and polished to a high shine. The cabin of the vehicle is high with bench seats and drivers seat covered in light brown diamond pattern upholstery as is the roof and the sides of the cabin. The car is operated by levers inside the cabin, with five forward gears and five reverse. Detail on chassis "ANDERSON ELECTRIC / DETROIT, MICH USA / CLASS G-SIZE NO. 80 / PATENTED / MOTOR NO. 16770 VOLTS. [illeg]." The Anderson Electric Car Co. (1911-1918), Located in Detroit, Michigan, USA. Between 1906 and 1939 over 12,300 cars and 575 trucks were produced under the Detroit Electric name in Detroit, Michigan, USA. From 1906 they were made by the Anderson Carriage Co, from 1911 by the Anderson Electric Car Co, from 1919 the Detroit Electric Car Co, and from 1933 until 1939 the Detroit Electric Vehicle Manufacturing Co. The Anderson Carriage Co was established in 1884 by William C. Anderson at Port Huron, Michigan, which co-incidentally was Thomas Edison's home town. In 1895 the firm moved to Detroit and in 1906 Anderson reformed the company to make cars under the Detroit Electric name. Motor and controller equipment made by the Elwell-Parker Electric Co was selected for the vehicles, and the first was delivered in 1907. The early cars were the Model A Victoria, Model B Victoria, Model C two-passenger Coupe and Model D four-passenger Brougham. The coupe and brougham were among the earliest cars to be fully enclosed. Detroit Electric trucks were made from 1910, and the following year model designations changed from letters to numbers with 23 models offered. In 1914 the firm advertised that both Henry Ford, "the world's greatest automobile manufacturer" and Thomas Edison "the world's greatest electrical authority" had purchased Detroit Electric cars. The firm's cars were standardised in 1915 with a heavy chassis (Type A) version and a light chassis (Type B) version, both on a 100 inch (254 cm) wheelbase. A new under-seat controller was designed and introduced in 1917 with a reverse switch in the controller case. Detroit Electric cars were renowned for their quality coachwork, safety and dependability. Colours included Detroit blue, maroon or green. Production peaked in 1916 with 1,893 cars. At this time about 1,500 employees worked on a 21-acre (8.5 ha) factory floor. The design of the cars began to change with more of them being built with false fronts and dummy radiators to mask their motive power and unusual appearance, making them appear like the petrol driven cars on the road. Between 1918 and 1920 production figures dropped alarmingly due to the impact of the First World War and the influenza pandemic, but the company continued to produce its classic archaic design. In 1920 the firm was reorganised and, according to Galen Handy, it is likely that the last entirely new Detroit Electric car was made in 1926 and the rest of those sold as new, until 1939, were made from cars with modified or borrowed bodies. It is believed that about 94 Detroit Electric cars and one truck survive today (2008). This car is one of three in Australia; one is privately owned and the other is in the collection of the Western Australian Museum. This Detroit Electric car is one of a number owned by Sydney solicitor Arthur Wigram Allen (1862-1941) from 1917 as 'town cars'. Allen was a partner in the well-known firm of Allen, Allen & Hemsley of Wigram House, 19 Castlereagh Street, Sydney. In 1917 the horse-drawn vehicle manufacturers Angus & Son, of 165 & 167 Castlereagh Street, Sydney, advertised that they were agents for the Detroit Electric car and Allen may have ordered his cars from them. One of their advertisements from 1917 said "The Coming Car is Electric. The Best Electric Car is the Detroit. In the nature of things petrol must become scarce and dear. Every day electricity becomes more plentiful and cheaper. Electric cars are Cheaper to Operate, More Durable, Easier to Drive, More Comfortable to Travel in; and, above all, SAFER." Arthur Allen lived at "Merioola", a mansion in Edgecliff Road, Edgecliff, in the Eastern Suburbs of Sydney and purchased his first Detroit Electric in about 1917. During the First World War petrol was in short supply and an electric car appeared to be the family's answer for short trips. The range of travel for one charge of the battery was at least 40 miles (64 km), a round trip from the Allen's Edgecliff home to a holiday house, "Moombara" on the Port Hacking River in Sydney's southern suburbs. Arthur Allen had never driven a petrol car but quickly mastered the electric one. His daughters, Joyce and Margaret, both in their twenties, also learnt to drive it. At this time the self starter on petrol cars was still unreliable and swinging the external starter handles was both dangerous and heavy work. The electric car had the advantage of having no starting problems and both passengers and driver were protected from the weather behind the large glass windows, which gave excellent visibility. In those days the petrol car was either an open tourer or a closed limousine with the driver sitting exposed to the elements. Another advantage of the Detroit was that the doors could be locked, so coats and parcels could be left in safety. The Allens liked their electric car so much that they bought a second and then a third one. For the privileged Allen girls this meant freedom and independence, unusual at the time, to attend parties and dances without the need for parents or chauffeurs collecting them long before they wanted to go home. So Margaret Allen would fill the car with friends and drive them all home. She recalls in her book "I Can Hear the Horses" that the control lever was pushed forward through five notches. On number 1, the wheels just moved, and on number 5 it was full speed ahead, or about 30 mph (48.3 kph) on level ground. The car slowed considerably on hills, but, once over the top, the lever was pulled back and the very heavy car free-wheeled downhill at a tremendous pace. "The power in the batteries lasted for about 40 miles, so nearly every night the car was plugged into a charger. This was a terrifying machine, and I never lost my fear of it. One stood on a rubber mat, and twiddled two knobs on the switch board. At the back of this was a large glass valve or tube, bigger than a football and with an alarming hiss, this sprang to life and was filled with a dancing blue light. The car remained on charge all night, and was ready for the road in the morning." Arthur Allen eventually owned five or six Detroit Electric cars. His friends who had bought them during the war sold them to him when petrol cars improved, so he had a couple kept for spare parts. New batteries became hard to get, and soon Arthur Allen and his brother Reggie were the only people who drove them. Arthur Allen became a familiar figure on Sydney streets, sitting in the traffic among the "modern" cars. He drove it every day until his death in 1941. With petrol again in short supply during the Second World War, the last of the Detroit Electrics was driven by Arthur's son, Arthur Denis Wigram Allen (1894-1967), known as Denis. He was also a solicitor in the family firm, then located in Martin Place, and drove the car to work in the city. In 1947 he presented it to the Museum and according to his sister, Margaret, drove the car into the Museum himself whereupon the floorboards apparenlty broke under its weight. Gifford, Margaret, "I Can Hear the Horses", Methuen-Haynes, North Ryde, NSW, 1983, pp.38-40.